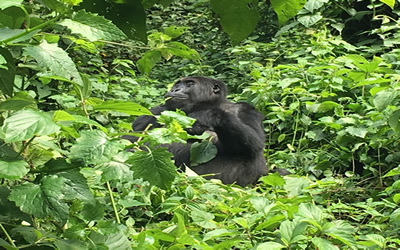 Explore Kahuzi biega national park to learn about things to do, best time to visit , gorilla habituation, nature walks visiting the water falls, Hiking Mount Kahuzi, Climbing mount Biega, chimpanzee tracking all located in the great itombwe mountains of congo while on a congo safari with an experienced tour operator. Kahuzi Biega National Park Congo is located in the Eastern Democratic Republic of congo just 50 kms away from Bukavu town which is known among the biggest towns in the eastern part with developed accommodation facilities including the orchids safari club , Coco lodge with modern amenities. 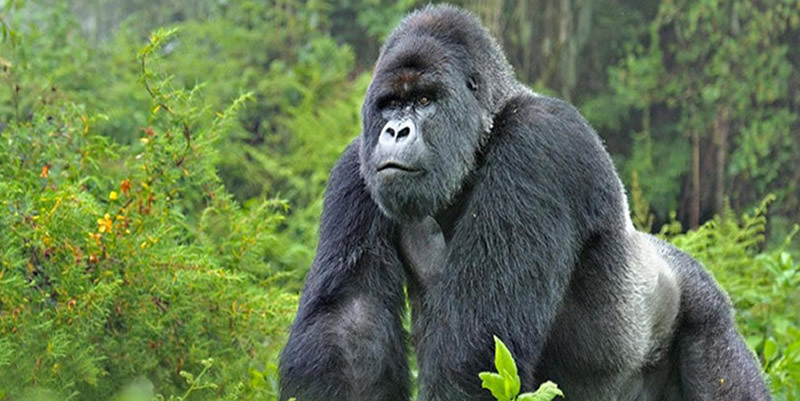 Kahuzi Biega national park is listed under the world heritage sites as its known to be the home for the most endangered species of the eastern lowland gorillas which are only found in democratic republic of congo in the entire world. The 75,000 ha eastern sector is entirely montane. The massif is part of the Mitumba Mountain range, the western mountains of the Great Rift Valley. The two main peaks, Mount Kahuzi (3,308 m) and Mount Biéga (2,790 m) are extinct volcanoes, and the massif dates from the late Tertiary or early Quaternary. The western zone is forested by equatorial rain forest, with transition forest between 1,200 m and 1,500 m. In the eastern zone, six different primary vegetation types have been distinguished: mountain rainforest, high-altitude rain forest, swamp forest, bamboo forest, sub alpine heather and swamp and peat bog. Kahuzi Biega National park covers an area of 60000 square kilometers with the Eastern part being the smaller mountainous regin measuring 600, and the largest part measuring 5600 square kilometers consisting of mainly lowland stretching from Bukavu to Kisangani, drained by Luuka and Lugulu Rivers which flows into the Lualaba River. Kahuzi biega national park was published in 1970 t0 conserve and preserve the Eastern Lowland gorillas (the world’s largest gorilla species. The park was also inscribed in 1980 as the UNESCO World’s Heritage site or its unique biodiversity of the Rain forest habitat and its eastern lowland gorillas. Kahuzi-Biega National Park operated and managed by the Institut Congolese Pour La Conservation de la Nature (ICCN) with offices in Bukavu town. Kahuzi-Biega National Park is famous as the largest refuge of the highly endangered Eastern Lowland Gorillas. The Park is divided into two sections that is the highland section with most of the lowland gorillas is open for visits at the most discounted price of 400$$$ for a gorilla permit , with 6 gorilla groups habituated for visitation and introduced the Gorilla habituation safaris offered by Local safari Companies . Kahuzi Biega National park is one of the biggest national parks in Congo after the great virunga national park which is the oldest national park in Africa as it was formed in 1925 as the home to the endangered mountain gorillas , all these two destinations are open for visitation for tourists activities like Gorilla trekking & Climbing mountains. Kahuzi Biega National park has rich diversity of flora and fauna protecting both plants, mammals and bird species, among which the Eastern lowland gorillas are the most prominent among the mammals found. Other primates include Chimpanzees, owl faced monkeys, elephant, Bush buffalo, Alexanders Bush squirrel. Kahuzi-Biega National Park contains a greater diversity of mammal species than any other site in the Albertine Rift. It is the second most important site of the region for both endemic species and in terms of specific diversity. Kahuzi Biega National Park protects over 136 species of mammals, among which the star is the eastern lowland gorilla & 13 other primates, including threatened species such as the chimpanzee, the colubus bai and cercopiuthic of Hoest and Hamlyn. Other extremely rare species of the eastern forests of the DRC are also found, such as the giant forest genet and the aquatic genet although congo safaris with detailed safari planner to search for these can be done on special arrangement with reliable congo safari company. All travelers that are planning a safari to Congo’s famous Kahuzi Biega national park have various options to enable them reach the destination for the memorable Gorilla trekking safari experience , those that will have booked Virunga Sector before heading to Kahuzi Biega are always advised to use the ferry that leaves Goma town in the morning and it takes 5 hours, this is local ferry and those with out time are always advised to book the private speed boat which takes 3 hours depending on the winds on the lake kivu. This ferry or speed boat you will drop you off at ihusi port or orchids Safari club and its where the driver from the park can pick you up . Travelers are advised to book their overnight stay in Bukavu hotels ( Coco Lodge, Begonaise , Orchids safaris lodge) as there is no hotel at kahuzi biega national park headquarters except camping . Yet those who are coming from the republic of Rwanda and having kahuzi biega visit as an extension of the Africa safari , your always recommended to cross the border using the Rusizi border 1 as the park driver can easily find you there at the Customs with the approved visa letter to ease crossing to democratic republic of congo . Most of the visitors who always visit Kauzi biega national park , come from either Goma or Rwanda via rusizi Border. The entrance of the park is at Tshivanga on the eastern side. Visitors always stop at Kigali international airport and proceed to congo by road whereby it takes a 7 hours drive to reach the border crossing at Rusizi.Therefore it is recommended for all visitors to spend a night in Kigali and then proceed to Bukavu the next morning, since international flights to Kigali often arrive in the late afternoons or evening. The most reliable way to reach the park is by using the congo tour operators who currently are offering Lowland Gorilla safaris in congo. Since the park is at the West of Bukavu, one can easily drive from Bukavu to the entrance of the park, then head to the road leading to Kavumu airport and turn left at the intersection of the town of Miti, and then stop at the Tshivanga visitors centre. For those coming from Burundi, it usually takes about 3 hours crossing from Rwanda border of Ruwa, to Rusizi , which is the shortest way to the park. For those who would prefer to use the Ugandan route, it may be a little bit hectic because it requires an overnight stay in Musanze if the visitor is to cross via cyanika border to Rwanda,and then drive to Bukavu the next day. Airlines are also available whereby visitors use domestic charter flights from Kigali to Rusizi border and then cross to congo(Bukavu town), after then you are required to take a 4×4 fleet to the park,that might take about 90 minutes to reach. No Safari lodge or accommodation is located at the park of Kahuzi biega but all accommodations are located in Bukavu town as its the most developed city closer to the park and all travelers spend their nights in Bukavu town and travel in the morning hours to Kahuzi biega national park for the safari activities booked , Never be lied by any tour operator that lodges are near the park .These lodges and hotels in bukavu provide quality delicious food, bed facilities and services which includes coco lodge and orchid Safari Club . Both budget and luxury travelers are assured of the best services offered at pocket friendly prices. 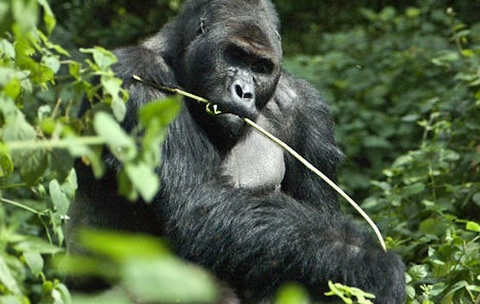 Kahuzi biega national park is famous for eastern lowland gorilla trekking in Congo. The Eastern lowland are distinguished from all other gorilla types by their stocky bodies, large hands and short muzzles and mainly feed on fruits and other herbaceous materials. Kahuzi biega national park has two eastern lowland gorilla families exposed for tracking while others are still undergoing habituation process. These are the most peaceful and social primates featuring about 5-30 members with an alpha male being the dominant in the family who is always responsible for the protection and establishing the home for the rest of the family members. With lowland gorillas, kahui biega becomes is off the beaten tracks whereby your time and money spent will make agreat difference in your life that you will never regret. Trekking involves hiking in the tropical rainforest following different trails depending on where they slept the previous night. Trekking lasts for about 30 minutes to 5hrs and most visitors feel the real family experience within the 1hr spent in the presence of the primates. You don’t only stop at trekking the eastern lowland gorillas, but also the stunning views of the Park that is clearly seen from the two peaks of the volcanic peaks of Mountain kahuzi and Mount biega that are situated within the heart of the park. These mountains are inactive with Mount kahuzi standing at an elevation of 3308 meters above sealevel and Mount biega at 2790m showing the park’s entire view alongside the wildlife , neighboring communities and other countries not forgetting the bamboo and sub-alpine vegetation which harbor various animals hence providing chances of encountering owl faced monkeys and variety of birds. Kahuzi biega is a paradise for bird lovers with approximately 342 bird species of which 42 are endemic to the park. Among these sported birds include; yellow crested-helmet shrike, African green broad bill, Congo peafowl, Rockefeller’s among others. The park is now one of the threatened sites put under the protection of the International Union Conservation Area (IUCN). Nature walkers have to follow trails in the tropical rain forest to different tourism sites, including the Tshibati water falls which also leads to other three water falls. The walk takes trekkers through different vegetation types, different wildlife as well as beautiful sounds from the birds singing up on the trees, which brings up great relaxation of the mind. By the time travelers leave the forest; they have clear minds and more knowledge about wildlife in the national park hence a memorable experience.